Ambient Water DVD is the ultimate video aquarium. It's all the fun of an aquarium without any of the hassle (shot in HD!) 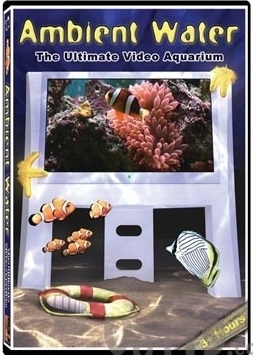 This DVD is an aquarium full of active, colorful fish mesmerizing to almost anyone. You can’t help but be captured by the fascinating, ever-changing, constant activity of a fish tank. This “virtual” aquarium features schools of small, beautiful fish, swimming in and out of coral and their hiding places. Use it as a landmark, diversion, attraction, respite video or simply a virtual aquarium – no feeding, water changes, or care needed. Need to relax? Love fish? Then the Ultimate Video Aquarium DVD is for you. The Ambient Water video aquarium DVD includes over 3 hours of gorgeous and vibrant fish captured in high definition for the best picture quality and clarity. Choose your favorite aquarium and pair it with soothing bubbling sound effects or a selection of relaxation music. With loop mode, there will never be an interruption in the action. Enhance the experience with built-in playlists or even design your own. Bonuses include desktop wallpapers for your PC or Mac as well as an underwater coral reef adventure. TRT: 190 minutes. The Ambient Water DVD is one of the most popular aquarium DVDs ever filmed. Its extensive use of interactive features allow you to fully customize your virtual aquarium experience. More than an hour and half long, this is far more than a video loop, playing the same fish, doing the same thing, over and over. People cannot help but be captured by this interesting and intriguing video, and there’s no feeding, fish purchases or work involved! Just turn it off when you’re done and when you turn it on again, the fish will be there – right where you left them! Choose to watch a single scene looped continuously for the ultimate, "Hey, my TV is now an aquarium", effect. Or build a custom playlist of scenes for greater variety. Match relaxing music choices with an array of stunning freshwater and saltwater scenes or simply listen to the natural sounds of a bubbling aquarium. It's all up to you and it's all available on Ambient Water. Lovely, beautiful, relaxing, restful, etc. to me. The music is fantastically restful to me. My loved one living with severe dementia has not yet been focused on the aquarium, but definitly loves the music as well as me. It loops so plays indefinitely. I would purchase the music even without the videos of the aquarium. I highly recommend this for ant person living with dementia. Major plus is no aquarium to clean or maintain.